Treasure Chest - a voice of New Life Church in West Linn, Oregon: Want to Serve Missionary Kids? Want to Serve Missionary Kids? Tim and Wendy Tutty are hosting a Black Forest Academy (BFA) "Information Hour" on Monday, August 13 from 6:30 - 7:30 p.m. at 6131 Barclay Street in West Linn. If you are interested in missions, or if you are in a ministry pointing others toward missions, please come! 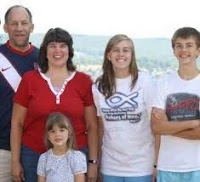 Eric and Lynette Sturgis, missionaries to BFA, will discuss how anyone can serve there. Childcare is provided. If you plan to attend the shared meal, arrive at 5:30 p.m. and bring a potluck dish. Our heart for missions began in our younger years while growing up, largely because of exposure to missionaries at church and in our homes. In 2003, God strategically laid Black Forest Academy on our hearts. One of our former youth leaders shared about the ministry of BFA and challenged us to "check it out." The seed was planted and over the next few years God continued to prompt us to pursue coming here to serve Him. As of 2010, we have been serving missionary students and families at BFA - Eric as a guidance counselor and Lynette as a school nurse. Eric helps students transition in and out of BFA. The Guidance Office staff also monitors graduation requirements and guides students as they explore their next steps. The nurses care for the physical, emotional and spiritual needs of the students, as well as injuries and advising the dorm parents when needed. We are so grateful to be able to use the experience and skills that the Lord has given us to serve in this capacity. Black Forest Academy is a wonderful place to use God given skills to serve missionary families and students. There is a need for elementary teachers, secondary teachers, support staff, guidance counselors, counselors, dorm parents, resident assistants, maintenance workers, business office staff and personnel staff. There is a place for everyone! You can check out details at teachbeyond.org or bfacademy.com. Come join us in this vital ministry, serving missionary kids and reaching the ends of the earth with the Gospel through education. Please feel free to contact us if you have questions at esturgis@teachbeyond.org.